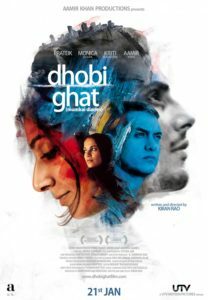 Dhobi Ghat follows the life of four interconnected people living in Mumbai. Shai (Monica Dogra) is a banker on sabbatical working on a project to chronicle the lives of Mumbai’s workers through photographs. Arun is a introverted artist looking for inspiration for her next project. Yasmin is a newly married immigrant from the state of Uttar Pradesh recording her experiences on a camcorder. Munna is a washerman (the titular “dhobi”) and rat-killer who aspires to become an actor. If you’re familiar with indie movies, this is not a particularly special movie, it follows a few characters, it’s mostly slice-of-life but has characters that change subtly because of their interactions and experiences. But for an Indian movie, that makes it unique. It’s quiet, it has well-developed characters and nuanced acting, it offers an interesting perspective, and above all, it lacks melodrama. I’ve never seen an Indian movie that took that approach to storytelling (I haven’t seen many Indian indie films, though) and I want more! There were actually people I could identify with! The score to this movie is fantastic too, it’s by two-time Academy Award winning Argentine composer Gustavo Santaolalla (though I’m most familiar with his work on the video game The Last of Us). I felt like the tone and atmosphere of Dhobi Ghat reminded me of Alejandro Iñárritu’s 21 Grams and Babel, I wonder how much of that was because all three movies were scored by the same person. 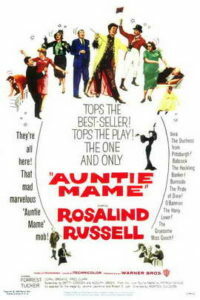 Even though the story is structured around Patrick’s life, Mame is the protagonist. Rosalind Russell plays her part marvelously, she’s charming and exasperating at the same time, and you are both worried and glad that Patrick has her in his life. The movie is very well-paced, despite being almost two and a half hours long, it feels engrossing all the way through and you don’t know where the time went. The characters aren’t always consistent – for example, the events at the end are resolved much too neatly, but that’s one of the only things that dates the movie, otherwise it’s suited to modern sensibilities. 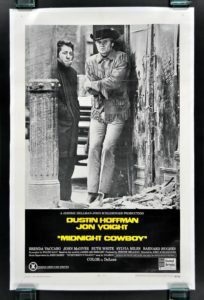 We’re slowly watching our way through all the Oscar Best Picture winners and got one more off the list with Midnight Cowboy. A young Jon Voight plays small-town Texan hustler Joe Buck who moves to New York City and hopes to use his cowboy image to become a successful male prostitute. He meets with limited success but befriends Enrico “Ratso” Rizzo (Dustin Hoffman), a small-time con artist. I didn’t know anything about this movie before we watched it except that it starred Jon Voight and Dustin Hoffman and that it won the Oscar for Best Picture. I had actually assumed it was a Western. It’s very good, especially for the time in which it was made. It explores things like prostitution, poverty, gay relationships, sexual abuse, mental illness and I think that’s significant for 1969. Jon Voight is charming as the naive and optimistic Joe and Dustin Hoffman is great at going from sleazy and lovable – you get to know his character at the same pace that Joe does and your opinion changes accordingly. One of the most notable things about this movie is its use of montages and images that represent Joe’s thoughts and memories, I think this must have been one of the first movies to experiment with those narrative techniques. Those sequences feel a little rough, like a new idea that hasn’t been thought through fully and it’s interesting to see the genesis of a technique we take for granted now. Also a fun fact: this movie was the only X-rated movie to win the Best Picture Oscar (although shortly after its release the rating criteria was changed and it was re-rated as R). 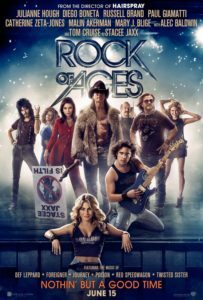 I’ve been looking forward to watching Rock of Ages ever since I ran into a clip of Tom Cruise singing Bon Jovi’s Wanted Dead of Alive while watching YouTube videos. I’m a big fan of 80’s rock, and the idea of a musical featuring entirely 80’s rock sounded excellent to me. The movie centers around the story of a young couple, Drew and Sherrie, who are both aspiring singers but it features an ensemble cast with their own (mainly romantic) subplots. There are a lot of great things about this movie but unfortunately it’s not a very good movie overall. My husband described it as “less than the sum of its parts”, and I think that’s a good description. The songs aren’t bad (Tom Cruise has a good singing voice, and all the songs he does are particularly good) and the movie does a decent job of contriving situations that the songs will work well in. The actors seem like they’re having fun, especially Alec Baldwin who is cast against type and Catherine Zeta-Jones who plays a delightful scenery-chewing villain. I found the actual story of the film incredibly trite, though, especially Drew and Sherrie’s romance. The play that the movie was based on had a story that sounded much more interesting, but I read that the movie’s director didn’t care for the play and made a lot of changes, which is a great pity. Alien: Covenant is the latest movie in the Alien franchise and Ridley Scott’s first movie featuring the titular xenomorph since 1979. 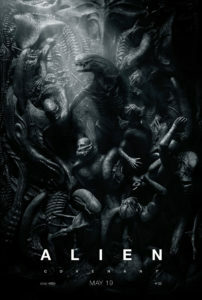 I enjoyed Ridley Scott’s Prometheus, and this movie was touted as both a sequel to Prometheus and a prequel to Alien. We follow the crew of the colonization ship Covenant who stop to investigate a signal that seems to be coming from a human source on an undiscovered habitable planet. Of course this turns out to be a terrible idea and you already know what the outcome is going to be – monsters bursting out of people’s bodies and pretty much everyone dying. Alien and Prometheus succeeded in part because of their masterful suspense, which is completely absent in this film, you see everything coming ahead of time. Even the xenomorphs are shown in broad daylight. Plus the writing is bad – the characters make such monumentally stupid decisions that it makes it hard to invest in the movie because you can’t suspend your disbelief that far. However, it does do its job of connecting Prometheus into the continuity and offering more insight into the genesis of xenomorphs, and it’s still fun to watch. Jack Dundee (Robin Williams) is a bank manager haunted by the memory of a pass he missed in an high-school football game more than a decade ago – the only time his team ever came close to beating the neighboring town that has been their long-time rival. In an effort to move forward, he organizes a rematch and recruits former star quarterback Reno Hightower (Kurt Russell) to help bring the team together. 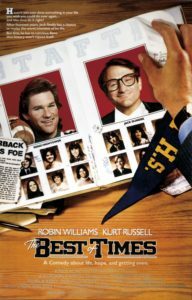 I was excited to watch this movie because I figured that anything with the two main characters played by Robin Williams and Kurt Russell had to be good. Unfortunately I was wrong. There isn’t anything hugely wrong with this movie, it’s just a mediocre comedy. Or maybe there is something wrong with it and the two lead actors’ performance elevated it to mediocre. In any case, the result is forgettable. Sara (Julia Stiles) used to be a passionate ballet dancer, but after her mother dies on her way to attending Sara’s Juilliard audition, she gives up dancing. She moves to her father’s apartment in Chicago and starts dating Derek (Sean Patrick Thomas), who helps her rekindle her dream of continuing ballet at Juilliard. But they also have to deal with the social consequences of being an interracial couple. 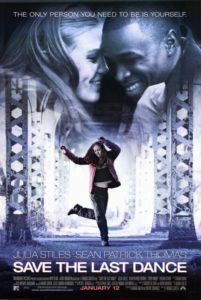 I’m usually a fan of teen coming-of-age movies, but I didn’t find Save the Last Dance very compelling. The core of the movie is the relationship between Sara and Derek, but I didn’t think the actors had good chemistry and the progression of their romance is non-existent – they seem to be either instantly in love or arguing just because the plot wanted them to. The characters surrounding them are pretty inconsistent too.